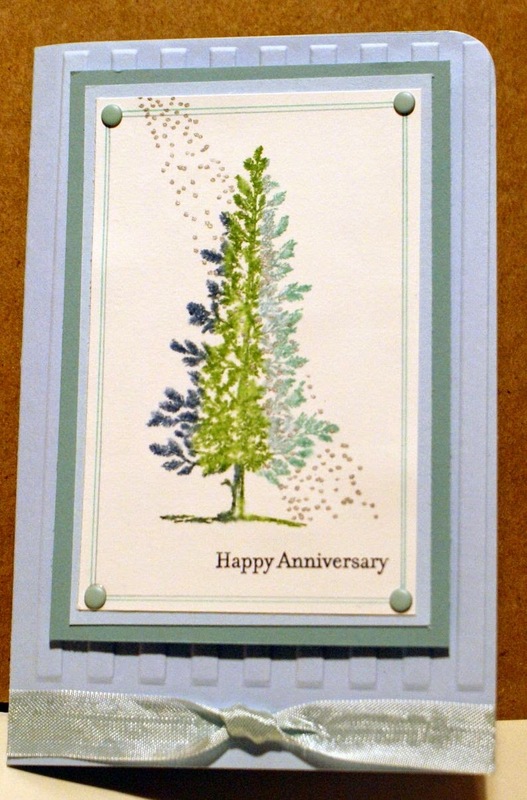 It was our 18th wedding anniversary this month and i had an idea for a card using the Lovely as a Tree stamp set. I could not find my Lovely as a Tree stamp set though! In the end I turned my craft room upside down and was finally rewarded with my long lost stamp set. I had put it away very safely them promptly forgotten where it was. Needless to say, it is now in a very visible place in my craft room. I embossed the front of my card with a striped embossing folder then layered my image on two different colours of cardstock before drawing a double line around it on the Whisper white. I anchored the corners of my top image with Candy Dots. The greeting came from the And Many More stamp set. I rounded two opposite corners of the card with a corner rounder punch. Finally I added some seam binding ribbon to the bottom. I added special things to the inside of the card, printing off a recent picture of us both and writing him a poem just for him. It was lovely to see his face when he opened his card (I think I even saw a tear, but of course he said he just had something in his eye! )and it is still on display so I know he liked it. The supplies I named are still current. The unnamed cardstock colours are retired. Susan,that's so pretty love the colours they are among my favs .The tree is amazing I will try that myself if you don't mind . Lovely card Susan. The sunbeam was a great idea. Stunning card! I love the colors. Happy Anniversary! What a beautiful card Susan, I love the colour change on the tree and the sunbeam as its silver could be a moonbeam but whatever its fabulous.